My Bullseye pistol league doesn't keep records for NRA classification. How can I go about getting a classification? Is there a way to do it by yourself, ie: honor system/mail-in the targets? Or do I have to shoot at an NRA sanctioned event? Thanks! None of the leagues I shoot in send the scores for classification. I don't think there is any way to do it yourself. There are NRA sanctioned leagues that can count toward classification, but there isn't any way that I know of for doing it without competing in NRA matches. There are NRA "postal matches" where you mail in your scores. There is a "new shooter" category for unclassified shooters, but it doesn't say whether or not the postal scores count toward classification or not. dan allen wrote: None of the leagues I shoot in send the scores for classification. I don't think there is any way to do it yourself. So, is your classification from an earlier time? 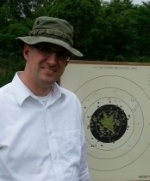 Rob Kovach wrote: There are NRA sanctioned leagues that can count toward classification, but there isn't any way that I know of for doing it without competing in NRA matches. Thanks for the link to the info Rob, I appreciate your help. I think I may have to call them to see if in fact a classification can be earned via the Postal Matches. If you aren't planning on shooting NRA sanctioned events, what is the point of having a classification? Word of advice, there are many people who have gotten a high classification from shooting an NRA league which was 22 only,and then regretted it when they found out what it did to them in their first few 2700's. Some people do well with the 45 right off the bat, but most don't. Shooting at the bottom of the expert class because you tank with the 45 is much more discouraging than shooting your first few matches as Unclassified. Some people just want their Marksman card so they don't have to shoot Unclassified with the Masters. Some leagues are CF only and others shoot a 22, cf, .45 900. Some people just shoot leagues, and they want to get classified. That's OK too. Schaumannk wrote: <snip> Kind of like worrying about your handicap when you don't play any golf tournaments. My classifications are from shooting in registered matches - not from any leagues. Never said I don't plan on shooting NRA sanctioned events, just that my local club, where I shoot presently, doesn't offer classification. I plan on taking this hobby to the next level once I feel more confident and my skill sets develop. I want the classification because I want a record of my achievements. It's a personal pride thing. We GOTTA get you out to some official matches. As long as you can keep your work on your own paper, it's going to be great! You will never look back, and it will bring your enjoyment of the sport to a whole new level! A little over an hour away from you to the west is the York Adams Fish & Game club in Abbottstown, PA -- it's where I shoot the NRA Open indoor Conventional Pistol Sectional match in the Spring. A bit over an hour's drive to the northwest is the Harrisburg Hunters & Anglers club; they hold indoor and outdoor Bullseye matches. Looks like the Palmyra Sportsmens Assn. in Palmyra is a similar distance and offers similar matches. There ought to be plenty of opportunity to shoot and earn a classification in your area. Thanks fellas. After the Holidays, I will definitely look into those places. I didn't realize they offered NRA matches. I would like to get Classified. Anyone know if that's available in the Tampa area ? I have a Range Officer and a Glock 34(don't hold it against me). I have some 22's but no target pistols. My wife says I'm Certifiable but I don't think she talking about shooting. PS. Did anyone have hard time taking those beautiful 1911's and putting a scope mount on ? Hi Skip! That G34, what kind of accuracy do you see out of it at 25 yds and up? Was wondering how they would do in the centerfire portion of a Bullseye shoot, that is, if they are legal for it. It's always a good idea to know the rules. There are 2 clubs holding matches in the Tampa area. 1. Wyoming Antelope Club located near the St Pete-Clearwater Airport. 2. Hernando Sportsmans Club 9 mi N of Weeki Wachi just off 19. They hold a 2700 every 4th Sun monthly. Colt711 wrote: There are 2 clubs holding matches in the Tampa area. Thanks Ron. I'm only a few miles Wyoming in Pinellas Park. I'll have to go check out a match. I found their website and calendar. Bullseye10X wrote: Hi Skip! That G34, what kind of accuracy do you see out of it at 25 yds and up? Was wondering how they would do in the centerfire portion of a Bullseye shoot, that is, if they are legal for it. I shoot at a 20 yard indoor range. At 20 yards a 3-4 inch group, standing, off hand, 2 hand grip, target iron sights, target ammo. I have a couple thousand rounds through the G34. After a couple hundred rounds I'm starting to do better with the Range Officer. If the new Range Officer 9MM shoots like the 45 I'll be selling the G34. I'm not sure why any shooting league wouldn't apply for NRA sanctioning. It is cheap, easy and provides you with the NRA backing. Our winter indoor league both smallbore and Pistol are NRA sanctioned. Everyone get a classification after the required number of rounds are fired and reported. We are the only shoulder to shoulder traveling league left in Iowa according to Dennis Willing.